Customers are great, in fact, they’re the best! It doesn’t matter what kind of business you are, without customers you’re not really a business. As with most things worth working for, client acquisition isn’t exactly a walk in the park. Competition is fierce, marketing costs are going through the roof, and the landscape of technology is evolving at a pace that’s sometimes hard to keep up with. As such, you work…no, you fight hard to earn each and every one of your customers. But that first transaction isn’t the end of the struggle, it’s just the beginning. Once you’ve got a new customers on the proverbial fishhook, you’ll need to keep them engaged and happy, an entirely new and ongoing struggle. More so now than ever, customers expect a seamless process, impeccable customer service, and your explicit attention when and where they want it, 24/7/365…and if you can’t provide them with what they want, their short little attention spans have them scrambling over to your competitors. What’s Driving Modern Day Customer-Business Relationships? In the last 4-5 years we’ve seen a massive paradigm change in the way customers and businesses engage and build relationships with each other. With technological advances have come lower barriers to entry into many markets and verticals. These advancements have served as a catalyst driving massive influxes of new businesses and SaaS products to markets. Customers today have information, services and options at their fingertips, with plenty of competitors to choose from. Couple that with many service models moving to a “month to month” model and you have a situation where customers can move from vendor to vendor with ease. Customers now have the leverage to demand a new level of service or threaten to switch vendors at a moment’s notice. Customer service (a big piece of customer success) is now on their terms, not yours. Customer success is and should be one of (if not the most) important goals of your company. When a customer succeeds, so do you, in many ways that you may not have thought of. Customer success isn’t just about making more sales, it’s about providing a service or product of such value and use that it actually makes a positive impact on the people or businesses that use it. And yes, it also impacts the bottom line. Increasing retention rates by a few percentage points can result in increased profits by up to 25%+. Further, a recent study by Gallup showed that B2B companies whose customers exhibited higher engagement rates achieved up to 50% higher sales revenues and up to 30%+ greater profitability than other companies. The key to customer success lies in your ability to improve experience and outcomes at every step of their journey – from first interaction to onboarding and every point forward and in-between. Unlike customer service, which often responds to individual queries or problems, customer success initiatives are continual and evolving. As you develop your customer success strategies it is important to understand that the experiences your customers have with your products and services often change throughout their lifecycle with your brand, and that you may need to tailor the experience based upon where each customer is in that lifecycle. For example, the first 90-days are a critical time in the customer success journey. During this time a focus on training, case studies, on-boarding, and support is critical to making a great first impression and establishing a strong foundational relationship from which to build upon. No matter which stage your current subscribers fall into, establishing and carrying out a seamless customer success experience addressing touchpoints throughout the customer journey is vital to the success of both your brand and your customers’ businesses. Once you’ve mapped out your customers’ journey you can effectively set up touch points, goals, metrics and ways to measure success at each stage. This approach will also help you to identify success bottlenecks and areas for optimization and improvement. When it comes to customer success, having a framework and benchmarking model to establish where you are now and where you need to be is quite useful. Begin to formulate your framework by working backwards. Start with defining the “ideal end customer” and work in reverse to identify what is needed to get them there. Siloing customer service and success efforts to your support team isolates important data and insights that can be used to help improve. For example, if your customer service team notices that they get the same support tickets regarding a specific issue on the homepage, they could pass that information on to the UI/UX team to make usability changes to prevent the issue in the first place. 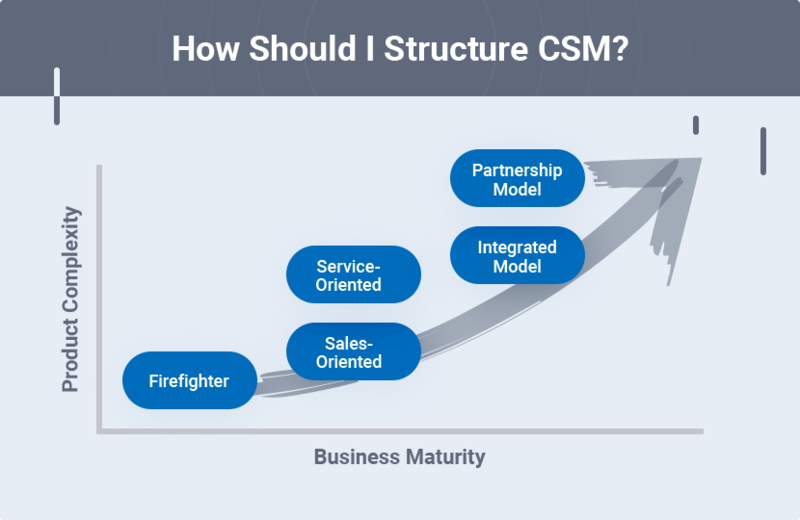 Think of customer success as being interdisciplinary with each department being able to contribute insights, data and feedback to a central command post responsible for overall “success” metrics and overseeing implementations. In an age of “I want it now”, customers want and expect help as quickly and efficiently as possible. Support channels may vary, from tutorials and “how to” articles to phone, email and chat systems. In a recent poll done by HubSpot, around 60% of global business respondents reported email and phone as their preferred channels for support. Another 26% preferred on-site forms and chat. The point is that client expectations will vary, and making your support systems easily accessible and available through various systems is an important consideration. Make sure your support methods are simple intuitive, responsive and efficient. As it relates to support, customers typically come to you with a specific issue or request in mind, and while solving that issue for them is priority #1, you should also train your teams to dig deeper. Asking open-ended questions to clarify and understand the issue may present opportunities to explore other means of improvement or the identification of unrelated issues. Your customers can be raving fans, telling everyone they know about how great your company/product is, or your worst enemies, spreading negativity about your brand across social media for everyone to see. Which bucket your customers end up in is largely up to you and how you treat and support customer success within your organization. For better or worse, your customers are largely in control of your company’s destiny, and if you haven’t felt the impact of that paradigm yet, it’s only a matter of time. By following the steps in this article and by delivering an amazing experience for your customers, your brand will not only experience success, but will likely outpace much of the competition.